http://www.fransduijts.nl/?st=maps21 Juice Master, from the makers of Birds pop mania, Spots Connect, Pastry Jam, Garden Paradise & Halloween Witch Connect. It’s a fruit matching frenzy with a juicy twist! You’ve just opened a new juice bar in town and it’s already getting busy. Crowds of thirty customers are coming through the doors and it’s up to you to make juicy fruit smoothies and serve them as fast as possible. You’ll need to match 3 or more of the same fruit to add juice to their glass. When it’s full – the customer is happy! It’s not just about serving customers, it’s about getting the highest score possible and matching as much fruit as possible! Match different combinations of fruit to create special fruit with unique powers, such as the explosive fruit mine, X power and special seed. These special combinations are the key to getting huge scores! Combine 2 special fruits to get a master fruit that’ll help you get EPIC scores. It’s the ultimate move on Fruit frenzy! Each level gets progressively more difficult and you may need a little help completing the challenging stages. As you level up, you’ll gain access to useful power-ups to help match fruit, make delicious smoothies and have lots of happy customers. Master the power-ups such as the hammer, knife, mixer and magic wand to help you complete the difficult stages, get huge scores and dominate the leaderboard. • 500 challenging levels – more coming soon! 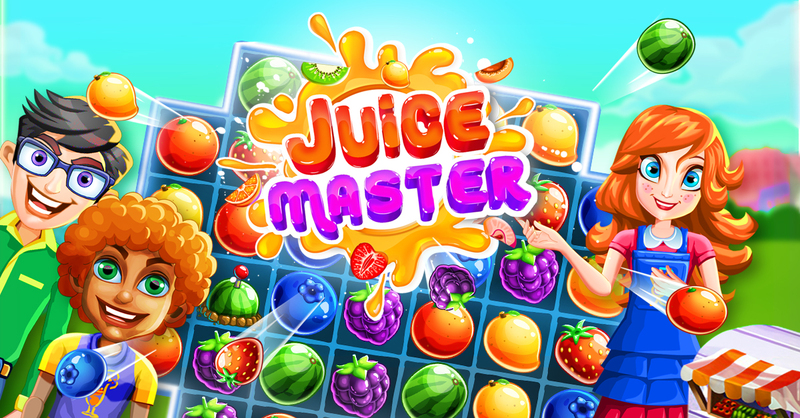 With over 500 levels and more being added with every update, Fruit Master gives fans of the classic match 3 game hours of juicy jam city fun!